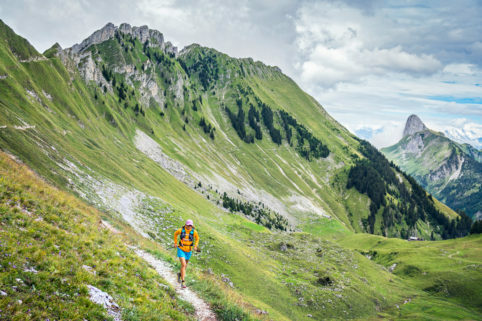 Here's an easy run to add to the to-do list. 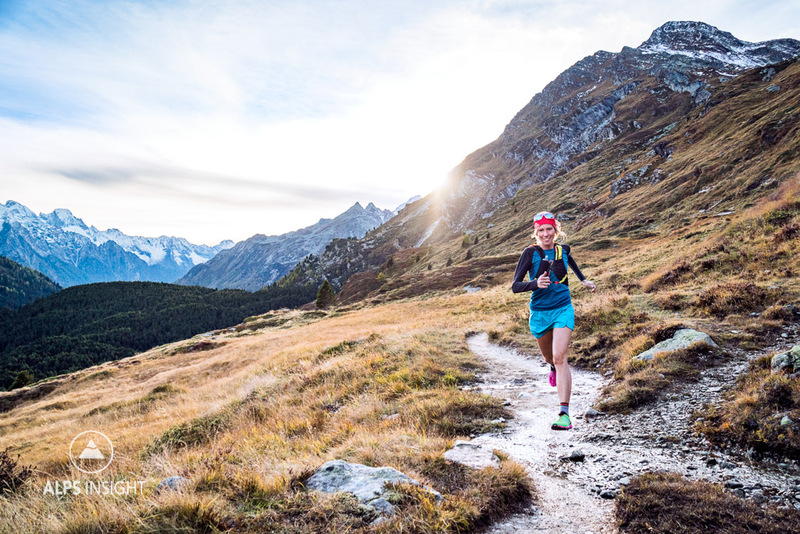 It isn't so many kilometers, and the gain won't destroy your legs, but the setting is no less beautiful than longer days in bigger mountains. You might spend more time out here than expected since the lakes and views entice you to stop and linger. Not far outside St Moritz, you curve along the calm turquoise water of Lej Segl. 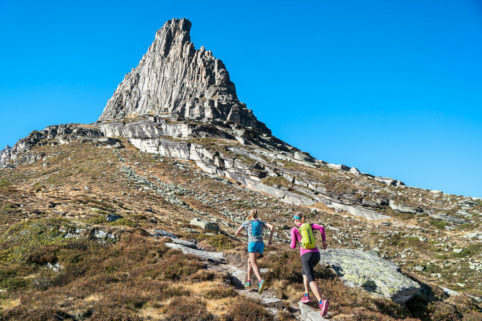 After coasting around the lake, you head up to the alpine Lägh dal Lunghin surrounded by Piz Lunghin and Piz Grevasalvas, another tempting stop. Next up, the loop up to Piz Lunghin. It's only 3km and 300m gain, but it adds a little technicality and exposure to an otherwise gentle run. The trail down passes above the tiny village of Grevasalvas. When we ran past, alphorns lured us down to the stone and wood houses, to drink from the fountain and sit in the sun. It's a spot where you might lose all track of time, and you may not want to leave. Across the way, take in the views of the peaks that mark the border with Italy: Piz Roseg and Fedoz, Cima di Rosso and Cima di Castello. 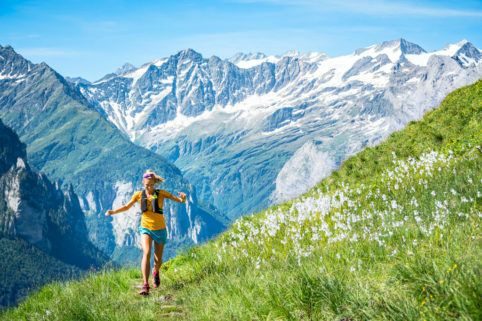 While you're in the region, be sure to also run the Rosegtal and Piz Languard. 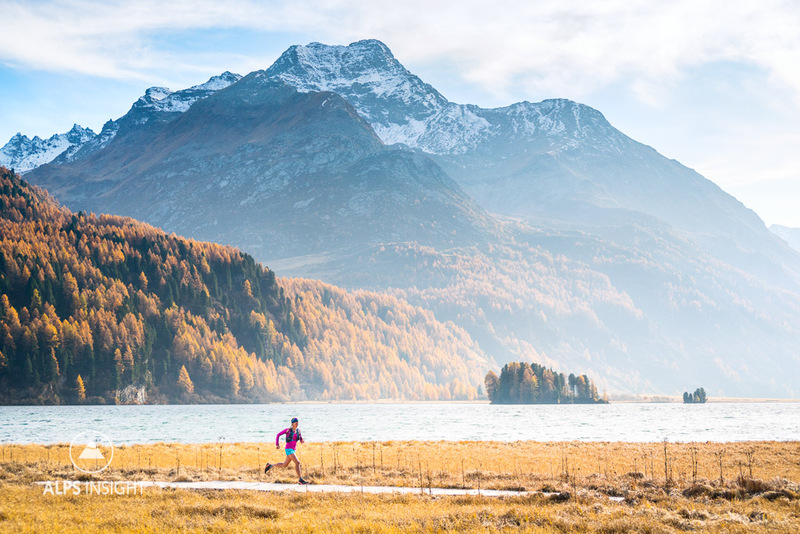 The Engadine is especially beautiful in the fall. 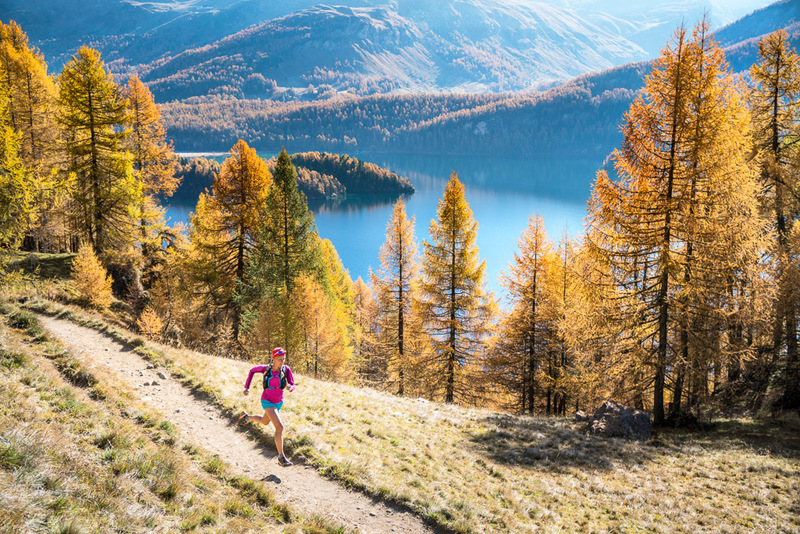 Go run through the changing colors. The first kilometers of forested lakeside are shaded. A great thing for hot summer days, or an excuse to get a later start waiting for sun in cooler weather. 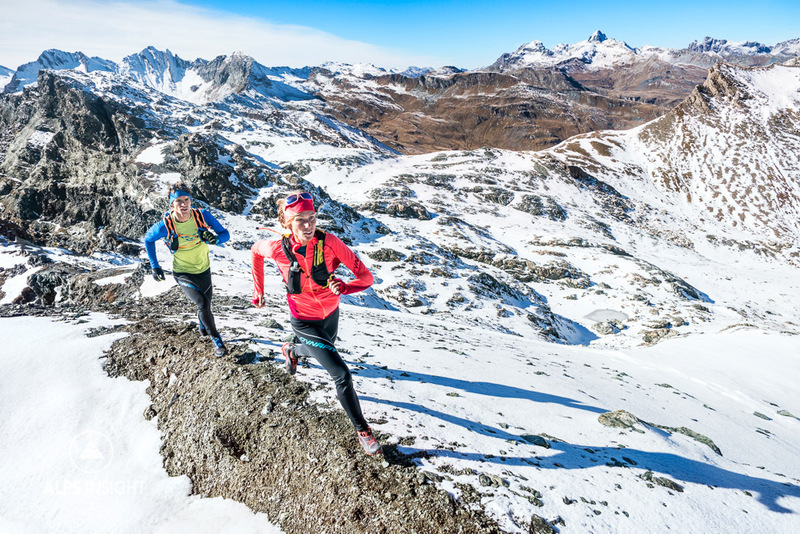 Our Run the Alps Switzerland guide book has lots more info! Kim cruising along the Silsersee's golden shores. 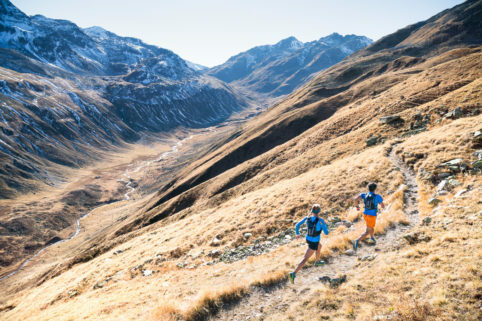 Graubünden's great runs are made phenomenal in fall. Piz Lunghin's descent is fast and flowing singletrack. Kim and Pascal Egli nearing the summit of the Piz Lunghin. Kim running happy after a quick side trip to Grevasalvas village. 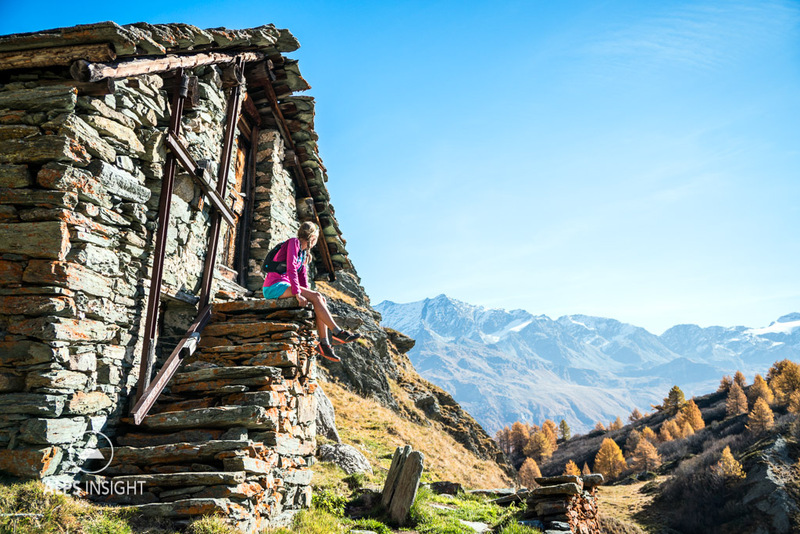 Make trail running in the Graubünden during fall colors a life list must do.